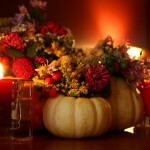 Thanksgiving has come a long way since the first one was celebrated in 1621. But the tradition of feasting on the fourth Thursday in November is still alive and well, especially at Old Palm Golf Club. As always, Thanksgiving dinner was held at the Club, and the buffet-style meal featured every imaginable traditional dish, all perfectly prepared by the chefs at Old Palm. There were hearty main courses such as Butter-and-Herb-Roasted Tom Turkey, Country Ham with Mustard Sauce, and Turkey Sausage and Sage Stuffing. Side dishes ranged from Buttermilk Mashed Potatoes to Turkey Sausage and Sage Stuffing to Brown Sugar Baked Yams with Pecan Crumble. The meal was so spectacular that most everyone had secondsâand even thirdsâand made sure that they left room for dessert. Pumpkin pie, fresh berries and Chantilly cream were only a few of the choices. The Club hosted quite the crowd for the holiday, and for those who preferred to dine at home a Thanksgiving To Go menu was available.